Alexander Hamilton, 1804-1806 by Patrick Weaver, oil on wood, Fenimore Art Museum, Cooperstown, New York. Gift of Stephen C. Clark, N0413.1955. Alexander Hamilton was born in Nevis in the West Indies to a Scottish trader and an English-French mother. His father abandoned the family and his mother died when he was young, leaving him with his cousin who soon committed suicide. Alexander was taken in by a local merchant and he became a clerk at an import-export company. After a hurricane destroyed his town, Alexander wrote about the incident and the townspeople were so impressed by his writing that they took up a collection to send him to the North American colonies. Hamilton entered King’s College (now called Columbia University) in New York City in 1773 and after graduation joined the New York militia against the British during the Revolutionary War. 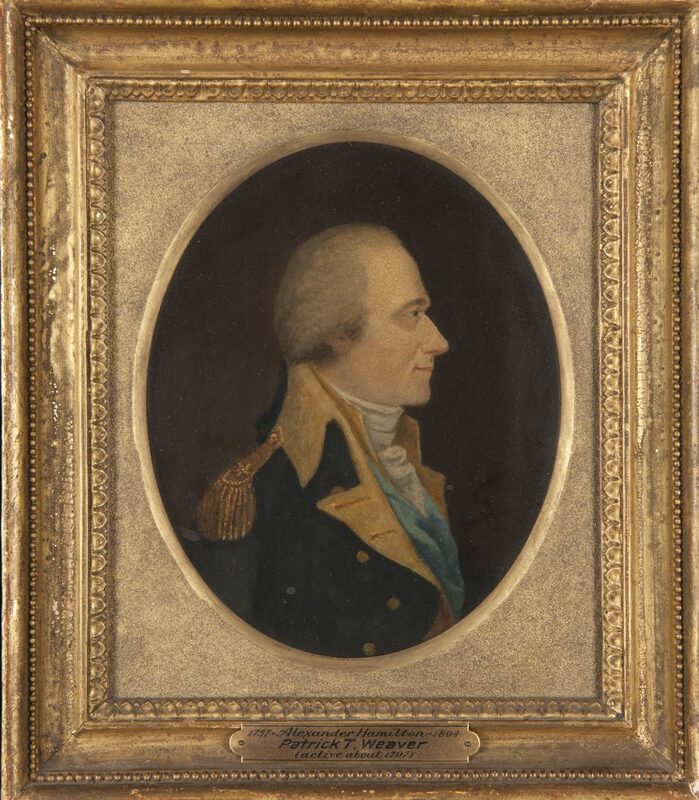 He gained the attention of General George Washington who made him his aide de camp, assisting him with decisions, orders, and writing many letters. At the Battle of Yorktown in 1781, the final battle of the war, Hamilton took control of three battalions who stormed a British fort late at night. Hamilton ordered his men to remove the bullets from their guns so that their entrance would be silent, and they were successful in their mission. After the war Hamilton became a highly respected lawyer in New York and was asked to join the Constitutional Convention, helping to draft the new U.S. Constitution. He along with John Jay and James Madison wrote a series of essays called The Federalist Papers that defended the proposed Constitution. When George Washington became the first U.S. president in 1789, he appointed Hamilton to be the first Secretary of the Treasury. In this role, Hamilton lobbied hard for and created the national bank system and the U.S. mint, still used today. Due to disagreements about this system, Congress split into two parties: the Federalists, which included Hamilton, and the Democratic-Republicans, which included Thomas Jefferson and eventually, Aaron Burr. In 1800, Aaron Burr ran against fellow Democratic-Republican Thomas Jefferson for the presidency. An Electoral College tie meant that the House of Representatives would choose the winner. Hamilton used his leverage to give Jefferson the win, calling him “by far not so a dangerous man” as Burr. In another four years, Hamilton again lobbied against Burr when he ran for governor of New York, which he also lost. These attacks to his honor along with a dispute about comments Hamilton supposedly made in private about Burr led to the duel which cost Hamilton his life on July 11, 1804. Hamilton was survived by his wife Elizabeth and seven children (an eighth child, Philip, died in a duel three years before Alexander). Elizabeth helped to fund the building of the Washington Monument and established the first private orphanage in New York City.